The connection between dental health & heart disease has been suspected for many years. Now we know for sure that gum disease and heart disease almost go hand-in-hand. In fact, if you have gum disease, you have twice the risk of getting heart disease. That means you are also more likely to have a heart attack. IF YOU HAVE GUM DISEASE, YOU HAVE DOUBLE THE RISK OF GETTING HEART DISEASE. Your heart is basically a muscle, like any other muscle in your body. It pumps blood around your lungs to get oxygen, and then round the rest of your body. Your heart never rests. It works away 24 hours a day, 7 days a week. Like the rest of your body, it needs oxygen. So it has it's own little arteries and veins. When your heart doesn't get the oxygen it needs, you're in trouble. The main cause of a lack of oxygen getting to the heart is when its little arteries get clogged up. When this happens, blood FLOW can't get through to the heart's arteries and veins as well as normal. If there is a restricted blood flow, then your heart is being starved of oxygen! The gradual build-up inside the arteries is a bit like lime scale building up inside water pipes or a kettle. As time goes by, the build-up gets more and more, gradually restricting the blood flow. You might notice this when you do a bit of exercise and get a pain in your chest. That's a warning sign. But the big problem arrives when a bit of the bacterial build-up inside the heart arteries breaks off. This tiny clump is carried along by the blood flow, and can get jammed into a smaller artery, blocking it off. When this happens, you have a heart attack. 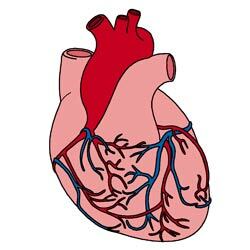 The section of your heart next to the blocked artery is starved of oxygen. Without oxygen, that part of your heart starts to die. So the real cause of all these problems is the heart's own arteries getting clogged up, so that less oxygen-carrying blood gets through, and the increased risk that a small clot breaks away from the accumulated build-up. Anything that adds to the clogging will make things worse. And that's where gum disease comes in. This is the dental health-heart disease connection. The bacteria living under your gums that cause gum disease can also get into your general blood circulation. As these bacteria travel around your body, they "run aground" in the small arteries of your heart. As they stick to the artery walls, they start to build up a layer of protein and fat. The more this layer builds up, the less blood can get through. And the higher the risk of a small clump breaking off and blocking an artery completely. When that happens, it's goodnight. So as you can see, dental health & heart disease are closely linked. But what can you do to reduce your risk of heart disease? To put it as simply as possible, make sure that you don't let gum disease get started in your mouth; if you already have gum problems, get it looked at by a dentist and hygienist, and then start a program of home care. All it takes is 15 minutes a day. REALLY IMPORTANT - read more at How to cure gum disease.